Mazoga the Orc will initially be encountered in Leyawiin, insisting somewhat insecurely that she is a knight. 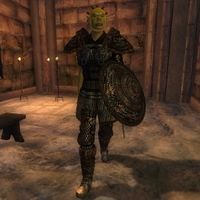 Talking with her or with city guards leads to the quest Mazoga the Orc, during which you will learn a bit more about her less-than-chivalrous past, and give her (and yourself) a chance to become a real knight. Mazoga wears a set of heavy armor (boots, cuirass, greaves, and shield) which is always the best available quality (based on your level). She carries a longsword, which is also of the best available quality. She also carries four restore health potions, another random potion, and a pair of leveled lower-class pants. After you kill Black Brugo and are both named Knights-Errant, she will also carry a Leyawiin shield and a key to the White Stallion Lodge. After you have completed the quests involving her, you will not be able to interact with her anymore. Her only response is: "I'm gonna go get me some black bows. Tag along if you like." It is advisable either to complete Mazoga's quests before you have started Sanguine's quest or wait to start after you have completed it. Performing Sanguine's prank with the other quests active can cause Mazoga to fight the numerous castle guards and probably end up being killed. You may consider not doing her quests and just keeping her as a permanent follower. However, she is not essential and therefore can quite easily die in combat. You can continuously pickpocket Mazoga's armor and weapons while she sleeps. She will eventually get more gear which may be better depending on your level. It will not matter if she catches you due to her low responsibility, though her disposition towards you will decrease. As your level increases, the caves to which Mazoga travels will also become increasingly more dangerous for her to explore. It is very common to find her dead in Rockmilk Cave, as it is inhabited by Marauders and Black Bow Bandits who will eventually kill her due to their overwhelming numbers. If Mazoga dies when fighting Black Brugo, after you have completed that quest a Leyawiin shield and a White Stallion Lodge key will appear on her corpse. This page was last modified on 20 October 2015, at 05:36.